It’s the final week of the Savedroid ICO. I have been doing an overview about this ICO already in English and in German. But since those only covered the basics about the project, let’s take a deeper look on how Savedroid works and what future plans Savedroid will bring. 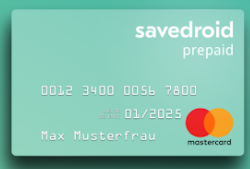 Savedroid is a german fintech from Frankfurt in Germany and is since 2015 on the market with their money saving app for Android and iOS called “Savedroid”. With their ICO savedroid wants to open the door for the mass market to invest in cryptocurrencies without the need of technical knowledge. For many new investors one of the entry barriers to invest in cryptocurrencies were not only the different kind of coins and tokens on the market, but also the many different exchanges on the market. To even start investing in cryptocurrencies, one had to read through dozens of tutorials or videos to at least understand what a portfolio is, how to store coins and how to trade with them. With the Savedroid project anyone can now start investing in cryptocurrencies of their choice. How does Savedroid work + examples? Basically everyone one of us have wishes. To one day buy a new smartphone, a new computer or even buy a new car. But in order to buy these products one have to save money. Putting aside money is not that easy, at least not for me. I personally tried to save money, but gave up on it after a short time, ending up using the money for other things. Savedroid has created an app, which connects saving money and your personal lifestyle. When successfully registered in the Savedroid app you can define your wish, let’s say buying a new smartphone for 500€. 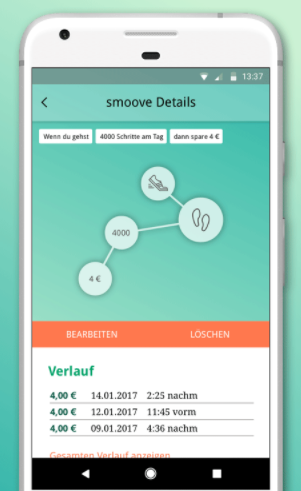 Now in order to reach those 500€, you can define certain events, also called “smoves” that puts aside money from your bank account. Let’s asume you want to reward yourself each time you are going to the gym and put 2€ aside. Or you can reward yourself each time you have successfully walked 3 km instead of taking the train. These activities can be easily and automatically be tracked through the savedroid app and your smartphone. So with this method you end up saving money without noticing it. Psychologically you end up beeing able to make your wishes come true. And over time as the savedroid AI learns more about you and your preferences, the app suggests you new personalized smooves to further optimize your savings, so you end up fulfilling your wish even faster. 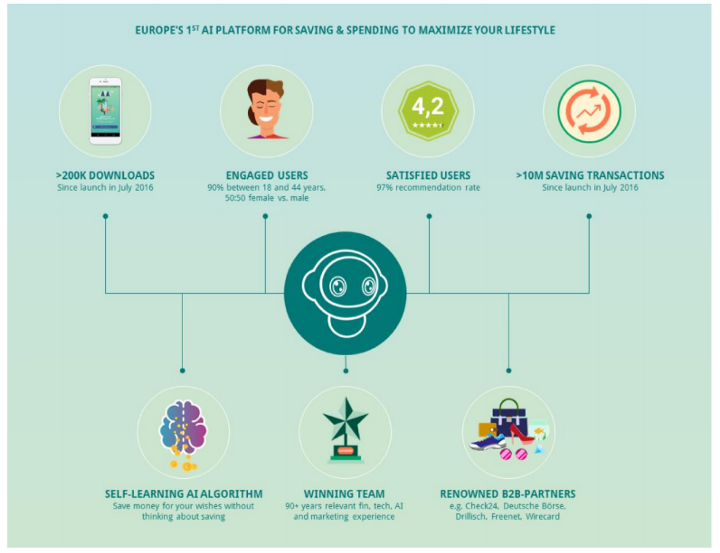 Shortly summarized, Savedroid enables the user to save money easily, automated and with an incentive to reward yourself when you do certain activities. Now what does this have to do with cryptocurrencies? Well now instead of saving your money in fiat money, you now can save it in cryptocurrencies. After successfully finishing one of your events (smooves) your money is invested in your choosen kind of crypto. This enables the user to invest in cryptocurrencies without having to do the bank transfers manually, searching for an exchange, sending the tokens to the wallet and so on. Savedroid does the job for you and saves your money in cryptocurrencies so you end up fulfilling your wish. Savedroid will also offer a “cryptocurrency credit card” so spending money to fulfill your wish becomes easy and fast. With their advanced algorithm savedroid also offers the possibility to diversify the crypto portfolio as well as switching easily from one crypto to another. Savedroid is working with quite renowned partners which offers them special discounts and features. As an example it will be possible to convert savings into amazon gift cards or getting discounts so you can realise your dream even faster. Below are some partners of Savedroid. As a German I can assure that those are quite famous companies here. 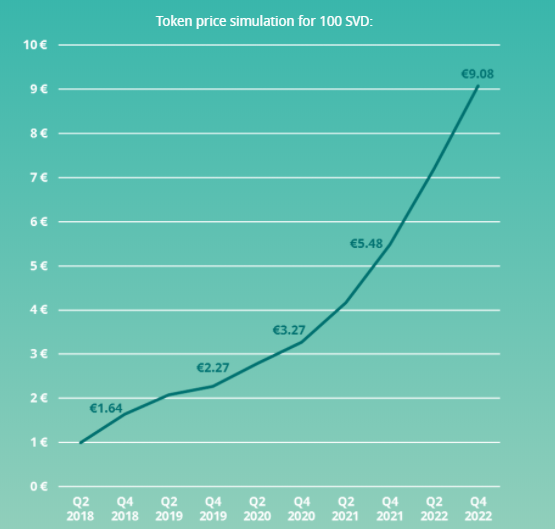 SVD-Tokens cost 0.01€ per token currently at the ICO. SVD-Tokens are the official cryptocurrency for the Savedroid ecosystem. In order to support the value of the tokens, Savedroid has a build in deflation mechanism as suggested by Ethereum Founder Vitalik Buterin, where with each transaction a certain amount of the total SVD-tokens will be burned. 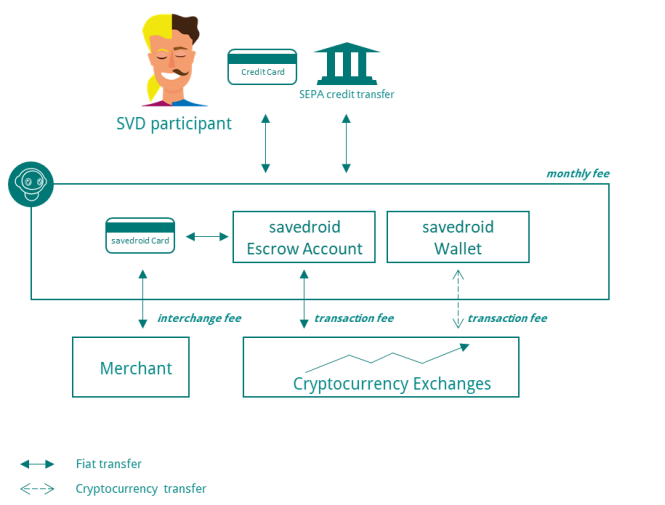 SVD-Tokens can be used to purchase crypto services within the savedroid ecosystem. For example tokens are used to pay fees and overall tokens provide user and network benefits for the further growth. With SVD-tokens, investment in cryptocurrencies like BTC, ETH, XRP, LTC, IOTA, Dash, Stellar and even more are possible. Future plans are also the integration of ICO investments. With Savedroid there will be one platform for everything so no need of switching platforms and registering to dozen of sites are necessary anymore. SVD-tokens can be bought now during the ICO and later on, on different exchanges or directly in the Savedroid app. For the exchanges, HitBTC, one of the biggest trading platform is already confirmed to list SVD tokens shortly after the ICO. Now after getting to know how everything works and seeing some real life example, let’s take a look at how Savedroid will do in the future. The figure below simulates how 100 SVD will be worth in a few years. Honestly, at the first sight it looks quite impossible. But with the Savedroid algorithm, their coinburn and the future crypto market growing, those prices might be able to be achieved over the next 3–4 years. My personal advice is that these are only predicted numbers based on a simulation, which can, but also cannot become true. So don’t put all your money in a project, which you cannot afford to lose. What makes me believe in the success of Savedroid? I hope I could give you a great overview about the Savedroid project, which I’m personally supporting myself. There is about 1 week left for their ICO token sale. So if you want to get a few SVD-tokens just head to their site and grab some SVD while the supply still lasts. For payment methods you can use BTC, ETC, Credit Card, Wire Transfer and Sofort.